This heart of roses wreath can be made in any color and has a number of creative uses: nestle it in the arms of a cuddly teddy bear to present to your sweetheart on Valentine’s Day … or attach a magnet and mount the wreath on your fridge for a romantic note in the kitchen. 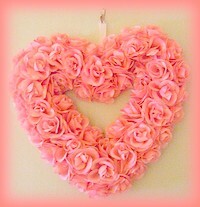 Simply add a ribbon loop to hang the heart of roses wreath on a wall or door. Or make an everlasting declaration of love on an oversized Valentine card – fold a rectangle of poster board in half to make the card, then mount the heart of roses on the front. 1. Paint the styrofoam heart in the same color as your choice of roses; let dry. 2. If you will be using ribbon to hang the wreath, fold it into a loop, stick a straight pin through both of the two ends, then pin in place at the top of the heart. Reinforce with a dab of glue. 3. If you’re using stemmed roses, or silk roses from a garland, it may be possible to simply pull the flowers away from the stems, leaving only the green plastic base encasing the bottom of each flower. If this isn’t so, use wire cutters to snip off each stem just below the base of each flower. 4. Begin positioning the flowers, starting from the inside of the heart and working outwards; we used three rows. Push the base of each rose into the styrofoam, remove, dip the base into tacky craft glue (or apply glue with a low-temperature glue gun), then reinsert the rose into the hole you just made in the foam heart. Note: if the base of the flower is too flimsy to stick directly into the foam, make a small hole first using the tip of a pen or a similar tool. 5. Continue adding roses until the foam heart is completely covered. You may prefer to postpone gluing the roses until all the flowers are placed as you like them. In this case, once you have a pleasing arrangement, begin removing the roses, one at a time. Apply glue to each rose as directed above, then reinsert back into place. — To make a cupid’s arrow, cut a triangle of colored felt or paper for the tip, and use a feather or two as the flight. Glue these to the ends of an extra long Valentine pencil, or to another straight stick such as a length of dowel painted to coordinate with the roses. You could even wrap ribbon around four or five bamboo skewers to use as the center part of the arrow. Push the cupid’s arrow into place between the rose; use a few drops of glue to secure. — Here are directions to make Cupid’s Arrow Pencils. — Nestle a cute little teddy bear or other small stuffed animal toward the bottom of the heart. — Try replacing the roses with other flowers, such as silk or paper carnations.